You can download the spreadsheet for the product information either by navigating to our website or by clicking this link. 1. Navigate to AscendRMS.com and log in. 2. Under the Your Account dropdown, select Vendor or Supplier Files for your country. 3. 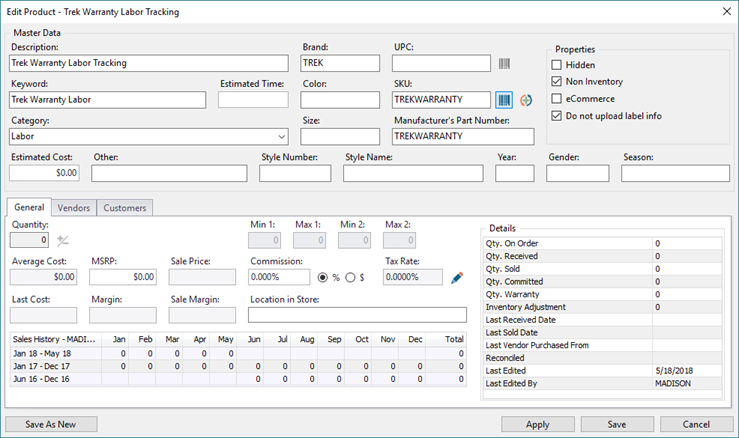 Find the Trek section and download the Trek warranty vendor product spreadsheet. 4. Open (and log into) Ascend. 5. Select File > Import > Vendor or Supplier Products. 6. Navigate to the location where you saved the file (generally the Downloads folder), and double-click the file. 7. Double-click Trek Bicycle Corporation. 8. Check all boxes for import. The products will be added to Ascend. Sherpa Tip: You will use this product for tracking purposes only. Trek does not pay for labor on Warranty claims. 10. Once the import is completed, navigate to Database Explorer > Products. 11. Find and open the product record (Part number is TREKWARRANTY). 12. Change the SKU to TREKWARRANTY. 13. Check the Do not upload label info box. 14. Verify that the Category is Labor and the NonInventory box is checked. 1. 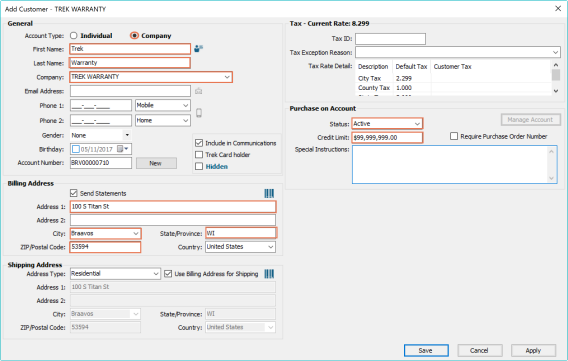 Select Create > Customer from the Ascend desktop. 3. For the Address, fill in Trek's address. 4. Set up Purchase on Account. a. Select Active from the Status drop-down menu. b. Set the Credit Limit field to $100,000. You can always change this number (up to $99,999,999.99), if needed. Claims need to be submitted through Dexter within 60 days of completing the Work Order! Before submitting the claim, please verify that the customer is the original owner of the product and proof of purchase can be provided. 2. Select the Services tab. 3. Click Claim Creator and Review. 5. Complete the claim information and submit it. Make note of the Claim Number. 1. Create a new Work Order in Ascend. 2. In the serial number prompt, enter the serial number. This will automatically pull up the customer's information (if they have a customer record attached to this serial number). 3. Add the Trek warranty labor SKU to the Work Order Detail. 4. If needed, add a Due Date or any other parts required for the repair. 5. Select Save or Save & Print. This sets up your Work Order Detail correctly, so that the bike stays connected to the correct customer. But the Work Order transaction itself needs to be connected to the Trek Warranty customer, so Trek can pay for the repairs. 6. Select Customer > Select or hit F11 on your keyboard. 7. Find and select the Trek Warranty customer account. 8. If applicable, add any discounts to the Work Order. 9. In the Comments field, write down the claim number. Once the work is completed and the customer is leaving with their bike, you can charge the Work Order to Trek Warranty's POA. 1. Open the Work Order you created earlier (for customer Warranty, Trek). 2. Select the Account icon from the payment types. 3. Next to Purchaser, click the magnifying glass icon and search for the customer who owns the bike. 4. 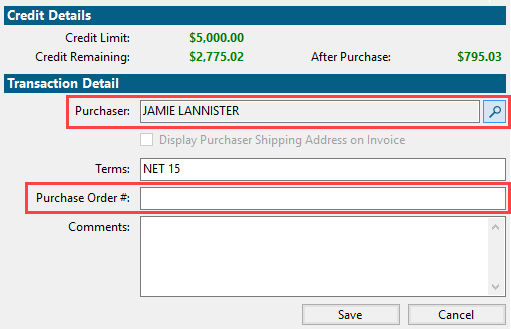 Enter the claim number in the Purchase Order # field. After a claim has been reimbursed to your shop by Trek, you can enter that information into Ascend. 1. Select Tools > Purchase on Account > Manage from the Ascend desktop. 2. Double-click the customer: Trek Warranty. 3. Check the box next to the Work Order that was reimbursed by Trek. 4. Select the payment type Check. Sherpa tip: Credits will be issued to your Trek account. Use the Check payment type to account for this - Trek will not send reimbursements as a check.